Your guide to the best Hotels in Aldeburgh. 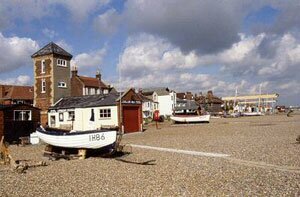 Aldeburgh is a lovely, small seaside town on the Suffolk coast. 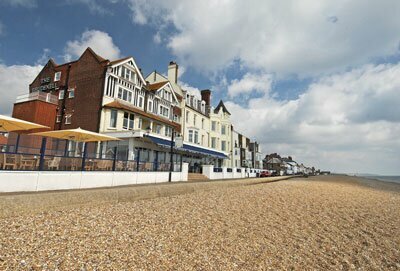 A great place to visit and very popular with tourists, the town boasts a long shingle beach, fantastic restaurants and great accommodation options. Read a Guide to Aldeburgh here. The White Lion Hotel is part of the same leading, privately owned, Thorpeness and Aldeburgh Hotels Group that The Bru belongs to so you can be assured of the highest standards in hospitality, service and value for money. Overlooking the shingle beach, The White Lion has 38 cosy and inviting bedrooms, some with sea views as far as the eye can see. Guests have the choice of dining in the informal beach-facing Bar or the newly refurbished oak-panelled Restaurant 1563. The Bar is well stocked with a variety of real ales and an interesting selection of quality wines, designed to complement a variety of meals and occasions. With its warm atmosphere, log fires and fantastic food, The White Lion Hotel is a wonderful hideaway from which to enjoy the natural tonic of a seaside holiday. Find out more here The White Lion Hotel, Aldeburgh. The Wentworth is a family owned and run establishment with 35 bedrooms, spacious lounges, a 2AA rosette restaurant and open fires in the colder months. The Wentworth is a stone's throw from the beach so take advantage of luxury accommodation with seaviews. The seaview rooms are all equipped with binoculars so that you may savour the picturesque coast. The Wentworth is also perfect for an Afternoon Tea if you're in the area. 'The Bru' is really rather special. Situated at the southern end of Aldeburgh, it is a haven of peace and relaxation, allowing you to escape the pressures of daily life. The Brudenell's 42 bedrooms have been recently refurbished and are all furnished to a very high standard; are decorated in a light, airy and relaxing style. Most have glorious views of the sea or the River Alde and its surrounding marshland - some of the finest in Suffolk. 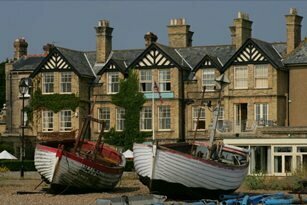 This is the only 4 star rated hotel in Aldeburgh and as a guest at the hotel, you will appreciate the magnificent coastal views, the first class restaurant, and the recently refurbished bedrooms that The Bru offers. In addition to the restaurant's award of two AA rosettes, The Brudenell has also achieved an AA quality rating of 87%. For full details please see The Brudenell, Aldeburgh. Please see for further information on the area. 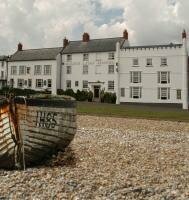 Have you stayed in an Aldeburgh Hotel? Let us know what you think by clicking on suffolkguides.admin@suffolktouristguide.com.